Whether you are a nature or an adventure sports lover, your vacation should definitely take you to Chakrata. Known earlier as Jaunsar Bawar after the Jaunsar tribe who were its early inhabitants, this stunningly beautiful hill station located in Dehradun district of Indian state of Uttarakhand, is a haven for nature lovers with its picturesque valleys, dense forests, rich flora and fauna and a varied bio-diversity. Chakrata was a prominent summer getaway for British officers who took shelter amongst its verdant forests and cool climate to beat the intense summer heat. Many years down the line, this dazzlingly beautiful hill station continues to attract tourists and nature lovers from all parts of the country. One of the most favoured tourist destinations of Northern India, this astonishingly beautiful and serene hill station is an ideal getaway for people who wish to be away for some time from the noise, pollution and hectic city life. Dotted by the coniferous forests, this scenic hill station located at 7000 ft. above sea level has plenty to offer to adventure and nature lovers as well. Mountain climbing, camping, trekking, etc are some of the adventure sports that a visitor to this spectacular hill station can indulge in. If you are an avid mountain climber, this is exactly the place that you should fit in your travel itinerary. The towering mountainous ranges of Chakrata holds promises of immense delight and thrill for mountain climbers. Kharamba peak is the highest mountain in Chakrata with an impressive altitude of 10,000 ft. This makes it an ideal hunting ground for professional mountain climbers who can test their stamina, professional skills and talent conquering this mountain. However, you need not despair if you are not a professional mountain climber. This breathtakingly beautiful hill station residing in the lap of the mighty Himalayas and surrounded by lush greeneries and dense forests all around has plenty to offer to wildlife enthusiasts, nature lovers, bird watchers, campers and trekkers among others. There are dozens of compelling reasons that should convince you to visit this scenic hill station so lovingly nurtured by nature. 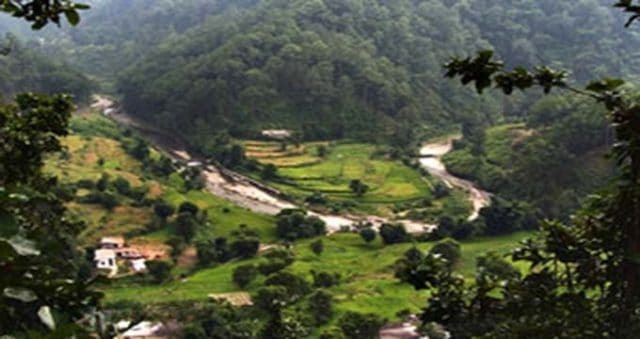 Some of the important tourist attractions in Chakrata are mentioned below. This wonderful hill station is home to some of the most amazing waterfalls that you are likely to encounter anywhere in India. Tiger Falls is one of the ravishing waterfalls which come highly recommended in all Chakrata travel guide. Other than this famous waterfall, there are more than a dozen important tourist spots in Chakrata like Kanasar, Moigad Fall, Deoban, Chilmiri Neck, etc that are going to make a visit to this spellbinding place memorable.